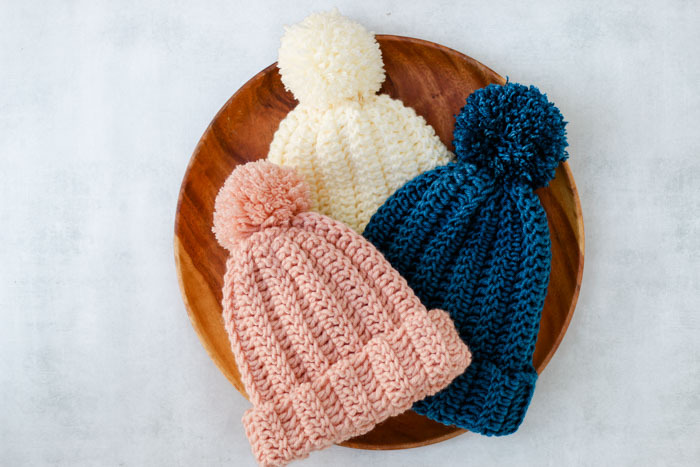 Whether you’re new to crocheting or just need a project that works up quickly, this free crochet hat pattern for beginners is astonishingly easy. 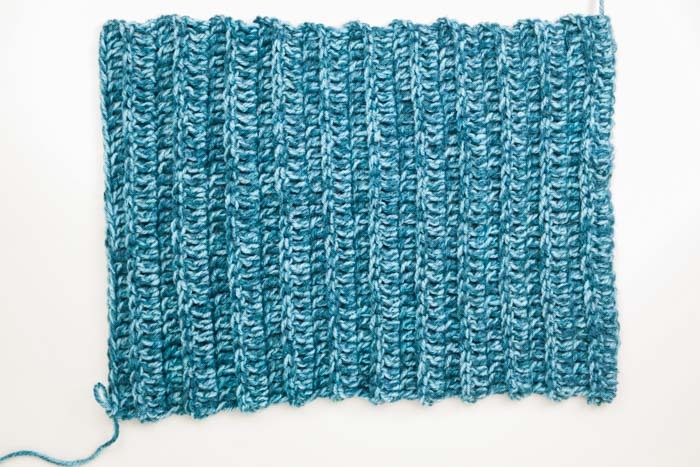 If you can crochet a rectangle, you can make this simple unisex beanie pattern! Get the full free pattern and video tutorial below or purchase the ad-free, printable PDF for $2.75 here. This 1.5 hour beanie crochet tutorial is part of a collaboration with my friends at LoveCrochet.com. This post contains affiliate links. UPDATE: I’ve updated this pattern to include another yarn option and extended sizes (preschool, child and unisex adult). You can find that version here! Sometimes we want to sink our teeth into a nice beefy sweater pattern. But other times it’s December 23rd and we realize we only have one thing for our dad/sister/grandma/mom to open on Christmas morning and like 12 things for everyone else. Enter the one and half hour crochet beanie. I’ve been really into crochet that looks like knit recently. (If you are too, you’ll love this collection of 15 free crochet patterns that knit and this “knit” crochet stitch video tutorial.) So when I set out to design this super speedy beanie pattern, I decided to give it a ribbed look that resembles the vibe of a classic knit cap. This is the crochet beanie I’d want if I were going ice fishing in Minnesota followed by dinner at my favorite ironic hipster hot dog stand. 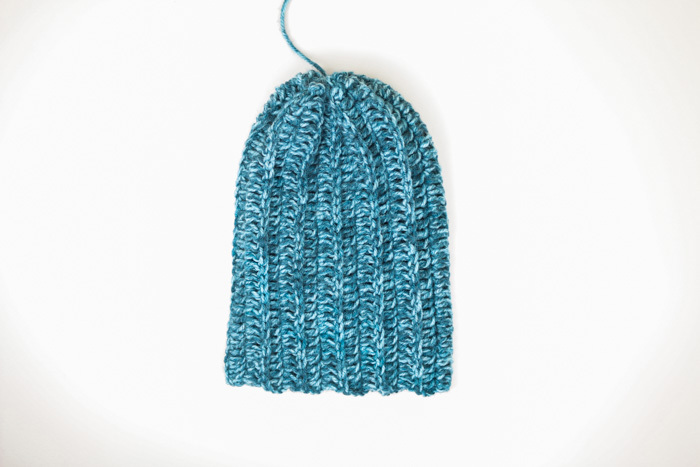 Because this beanie is so fast and simple, I think it would make a perfect crochet hat pattern for charity. (If you’re a charitably-minded soul, you might enjoy this free hooded blanket pattern as well.) And if you’d like to swap out the yarn to use something in your stash, just work a gauge swatch to determine how to make a rectangle with the same dimensions as the one in the pattern. I suspect two strands of worsted weight yarn held together might help you achieve a similar gauge to this Lion Brand Wool Ease Tonal yarn. 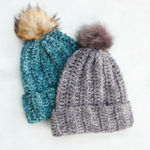 Thanks to LoveCrochet.com for providing the yarn and fur pom pom for this free crochet hat pattern for beginners. 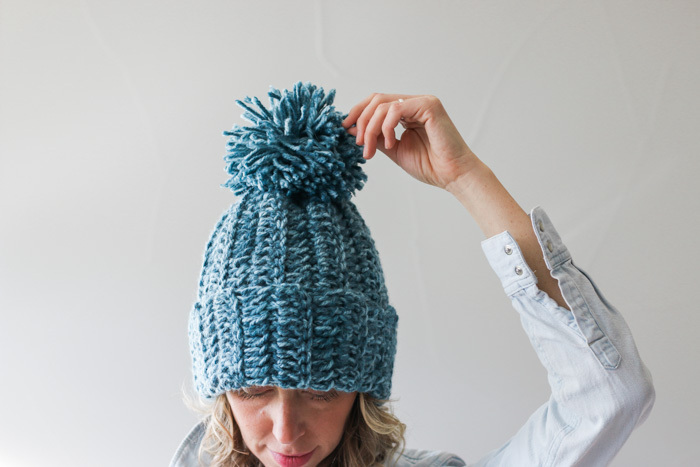 Watch a full step-by-step video tutorial of this beginner crochet hat below and scroll down a bit more for the free pattern! View the step-by-step video tutorial above. Need a last minute gift? Just learned how to crochet? Snowstorm blowing in? 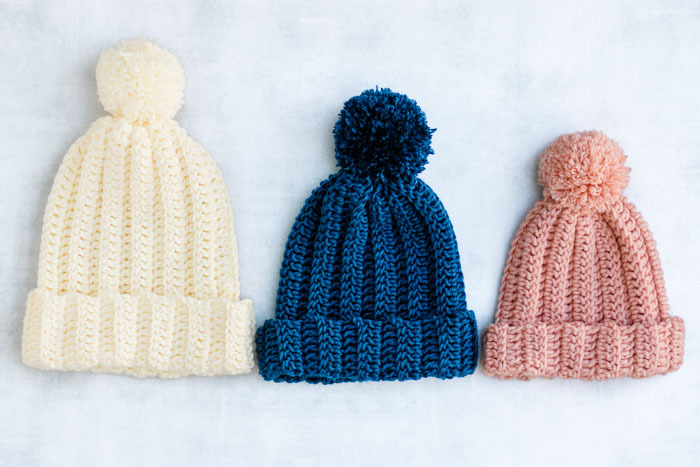 Whatever your situation, this extremely easy crochet beanie’s got you covered. It’s worked flat in a rectangle and then seamed to form a hat, making it a super speedy, mindless project to whip up in less time than it takes to watch a movie. • Hat is worked back and forth in rows. These rows will become the vertical ribs on the beanie. • After Row 1, the double crochet stitches are worked only under the back loop of the stitch from the previous row. This is always the loop farthest away from you, regardless of which side of the crocheting is facing you. Rep Row 2 16 (18, 20) more times to create a total of 18 (20,22) rows. Thread tapestry needle with tail from fastening off. Work from the top of dc st into top of corresponding ch. Then work from bottom of next ch into the bottom of the next corresponding dc. Continue like this through the top of one dc to the top of one ch and then through the bottom of one ch and the bottom of one dc. Repeat until end of seam. 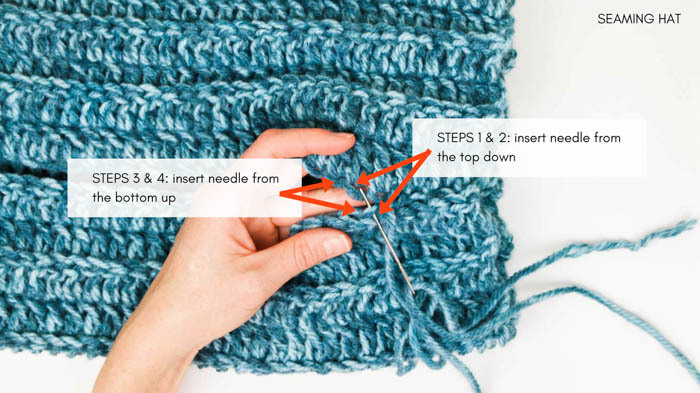 Tie a simple sewing knot by inserting needle in crochet fabric to create a loop of yarn, then inserting needle through loop of yarn and pulling tight. This will prevent seam from puckering in next step. Do not trim yarn. Using tapestry needle and strand of yarn leftover from previous seam, whip stitch around the top of the hat, working one whip stitch into each row. Tighten circle as much as possible and use tapestry needle to sew up any remaining opening in top of hat. 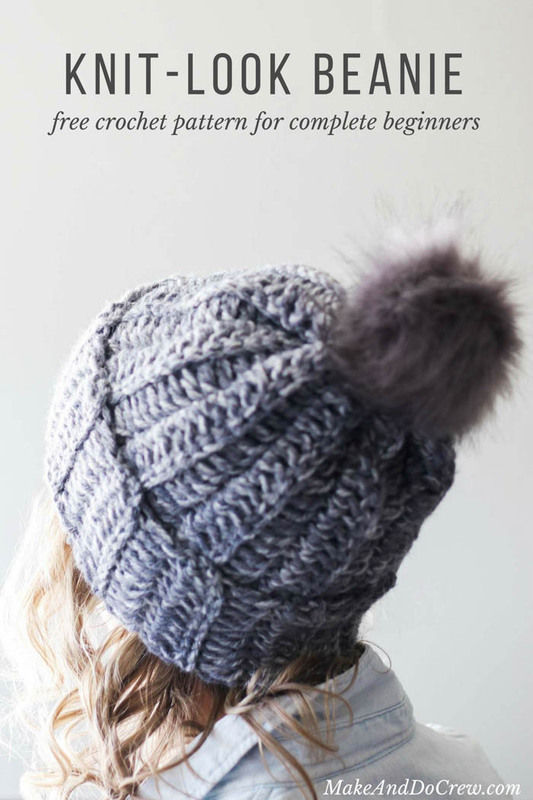 Use tail leftover from seam to sew fur or yarn pom pom to hat. Pop your new one hour beanie on your head and get to work on making one for everyone you know! So cute! Thanks for teaching and sharing! Any chance you can do some youtube tutorials? I’ll have a video tutorial for this very soon on LoveCrochet.com. I’ll link to it here when it’s available. Hi! I am so excited to finish this beanie, but definitely need a video tutorial to figure out everything after making the rectangle! When will this video tutorial be out? Thanks! You’re in luck! You can watch it now! 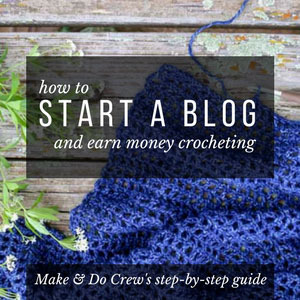 Thank You So Very Much for sharing another crochet pattern with us! You are very generous with your creativity and conconditional kindness. Blessings to You and Your Family not only at Christmas but throughout each day. I am so happy and a blessed to have found your fun crochet blog. 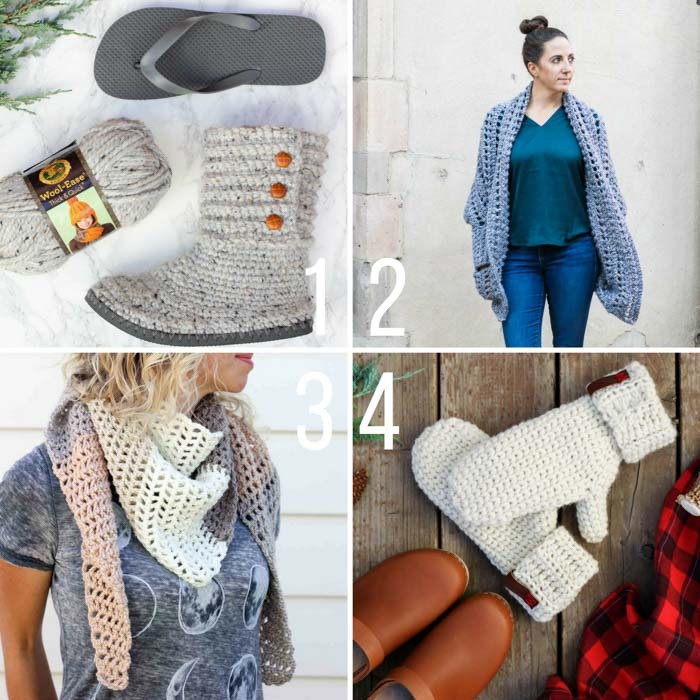 I’ve crocheted several of your awesome patterns for myself and for gifts. Thank you from My Heart and Hook, :-)! I have to ask..the first pictures of the hat, is that a FUR pom pom? 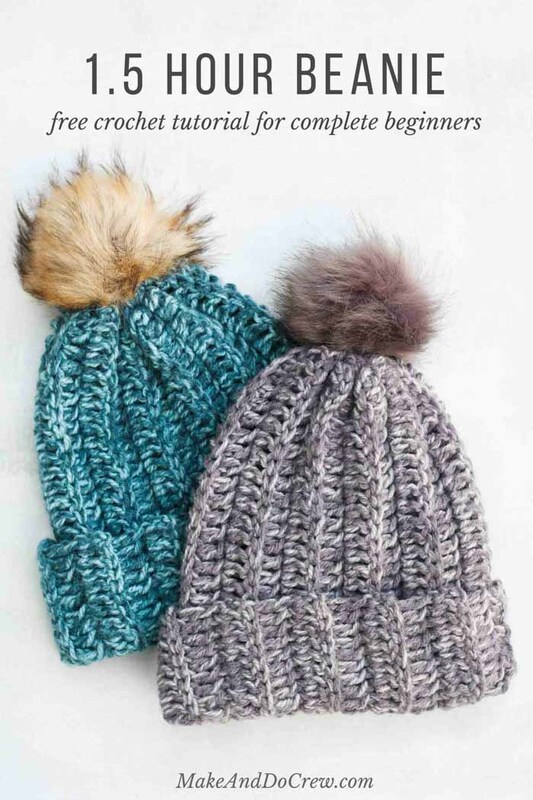 A “shop” on PETAs radar is knowingly and repeatedly torturing raccoons by skinning ALIVE to use this very same looking pompom…yes….. on a beanie. This is VERY irresponsible. Unsubscribe me immediately. Thank you for your concern. I agree torturing a raccoon would not be justifiable in the name of creating a crochet beanie. 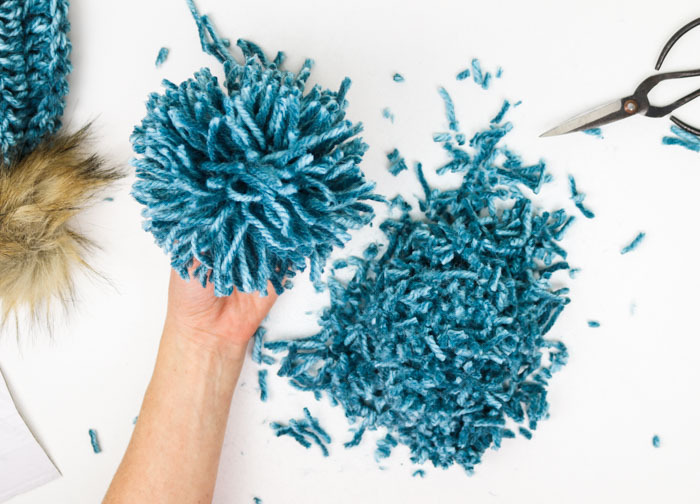 Just a couple of years ago Lion Brand was making an awesome fake fur yarn called Pelt. I made a long collar out of it and it fools people all the time, but when you get up close and really look, you can see that it is an artificial fiber. Wow, that yarn sounds awesome! I wish I could have tried it! Wow, talk about over reacting. Maybe let the author explain before threatening to unsubscribe! I love this hat, but it won’t let me copy it to a Word document, so I guess I won’t be making it. It’s too hard for me to work from my computer. I would NEVER try to sell your pattern as my own, or anything else nefarious, I just find that I cannot work from my computer screen. It’s so much better for me to print it in a larger font so that I can actually see it, lol. When the eyes get older, these things matter. Anyway, thanks for sharing your work (and I do understand that it is a LOT of work to create a new pattern). I hope that someday you allow us “older folks” to copy it to a form that we can use. I completely understand, and this is why I usually offer my ad-free PDFs for purchase for a small fee which covers the lost revenue from you not seeing the ads on the site. They’re formatted specifically for easy printing. It’s been a busy time for my family and I hope to have the PDF available in the next week. Thank you for the quick and easy tutorial. Question: Simply doing a DC in next DC, creates a flat fabric, should it be DC in front loop only of next DC to create a ribbed effect? Thank you for making the direction so understandable. I love to crochet but find some pattern hard to understand. Thanks so much for the free pdf and for all the patterns you give us the oportunity tu use. Hoping you have a wonderful Christmasand an extra special year. Thank you for your kindness, Elena. My father-in-law passed away last week, so this Christmas is bittersweet for us. I really appreciate the chance to share my creations with all of you though. 🙂 Merry Christmas! Thank you for this pattern! I haven’t attempted crochet in years and years. I have suddenly been craving a hook and yarn in the evenings while watching TV! I’ve been stalking your site for a couple of weeks now. I am going to visit a lifelong friend in a couple of weeks and will meet her toddler grandson. I want to make a couple of these for him. It seems like an easy project to get my feet wet (or my fingers ). I can’t wait to try other projects on your site as well, but figure I probably need to take baby steps at first. I am so sorry for your family’s loss. Thoughts and prayers are with you. Your generosity spreads happiness to many more than you know. The caps I will be making and gifting will delight many – not to mention my personal enjoyment of making and giving! Happy New Year! I enjoyed looking at your fa ebook page. I want to get started after Christmas is over. Thank you for sharing. Merry Christmas to Christmas. I just wanted to let you know I’m a beginner. Being really a green beginner I appreciate your direction’s you provide along with the pattern. Unfortunately for ME, I am better able to follow visually. Can’t seem to get my brain to connect and follow written direction’s. I’m giving your “knit”winter hat a go, seems easy enough that just maybe, I can make one myself. I look forward to seeing more from you… Have a Merry Christmas and safe and joyous New Year. Thank you, Deby! You’re in luck because I’m working with LoveCrochet.com to release a video tutorial of this pattern in the next few weeks. Thank you so much for sharing your ideas and talent. These hats are beautiful and i plan on making many. Your page would be great, except there are so many ads and videos my internet can’t handle it, and it’s hard to see anything. I’ll look into what I can do to improve the experience for you and other crocheters. 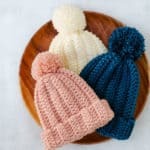 Could I make hats from your pattern to donate to my local Humanitarian center? I had a hard time with the leather soles but they don’t really need them anyway. 🙂 Thank you so much for your generous share of your craft. Someone recently told me handiwork is the key to longevity. Happy New Year and cheers to a long and happy life!! Welcome to the wonderful world of crochet, Mandy! 🙂 LoveCrochet.com should have the video tutorial for you very soon! I think it’ll be really helpful too. Hi! I saw this on Lion Brand’s Facebook post. I am wondering if you could make this and not put a Pom Pom on it? Or would it look funny on top? I’ve never made a hat but have crocheted for over 40 years!! I don’t think my hubby would wear a Pom Pom! Lol. Speaking of crochet to look like knot, back in the 70’s I made an Afghan that looks like an Aran knit . It was difficult but beautiful. I still have the Afghan and the pattern if you want it. Oooh, I’d love to see that pattern! You can email it to me if you’d like at Jess (at) makeanddocrew (dot) com. Thank you! I’m a new crocheter as well. I’m trying to make this beanie but its taking me a while ( so much for 1.5 hrs lol). I’m having trouble sewing it together. A hideo would definitely help. Looking forward to the video tutorial. Maybe I ‘ll put it aside for now. Lol. Thank you fir the patern, i’m not very good at it yet. Hi Jess! Thank you for the fantastic pattern, can’t wait to work on it!! I just have one quesion, is the foundation chain the same for all sizes? So 37 chain stiches for S,M and L? Thank you so much! Yes! You got it, Jessica. I am kinda new at crocheting so I was wondering if I used a super bulky #6 yarn how would I need to change the pattern? I can’t figure out how to whip stitch the top of the beanie. Is there a video of this? Thanks! I wish it was easier for a true beginner to uderstand. Maybe a slow video tutorial? So many great tutorials out there but everyone goes so fast that I have to pause and rewind so many times I get frustrated. I so far can do 1 chain (I thknk it’s called row maybe?) But when I go to add on row 2 the corner ends up rounded? Any suggestions? HI there! I am a beginner and just finished making your beanie! Thank you for making the instructions easy to follow! My hat turned out darling, except that I made it too large! I hope it will shrink a little when it’s washed! I can’t wait to make more of them! I love hearing that you made this, Sheri! Hi Jess, Thank you so much for sharing your inspirations. I am also a beginner but your patterns are easy to follow. Thank you for this easy pattern. I made it once and it was to small for me. I didn’t have the size of hook you were using so I used one smaller so it was a lot smaller than the one you made. I did 24 total rows, but it was still to small. I will be giving to charity. I made one today with a larger hook and tried to keep my stitches looser. I did 24 rows again and also 45 in the beginning chain so it’s more like a slouch and I love it! Thanks again! Well, I’m glad you got one great hat and one charitable gift out of your crocheting! Win win! Thanks for sharing your experience with the pattern. I made the M size hat but it ended up being way too long. I did the 37 chains at the beginning. I couldn’t find the yarn suggested in this pattern so I used Patons Classic Wool Bulky, 3.5 oz, . I’m wondering if that could be why it ended up too long. Your thoughts would be appreciated. 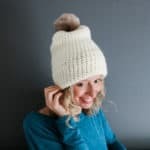 Hello, do you know what size crochet hook I should use to make this hat with the lion brand wool ease thick n quick super bulky? And what adjustments I would need to make? I’m terrible and doing gauges and am fairly new to crochet so any help would be greatly appreciated! Thank you! Hello, do you know what size crochet hook I will need to make this using lion brand wool ease thick n quick super bulky yarn? And any adjustments I might need to make? I’m quite new to crochet and not very good at figuring out gauges either! Any advice would be greatly appreciated, thank you! Hi! I am making this beanie for charity and want to use Loops & Threads Kaleidoscope (Super Bulky 6), since I found it on sale and have so much. I made it and it is a bit big. If I go down in hook size to 6.00mm and do fewer rows do you think it will still work? Or do you have a different suggestion while still keeping with the number 6 yarn? I love the pattern and it works really quickly. I’m a fairly novice crocheter and would love your help troubleshooting. Thanks! Yup, I think your solutions are spot on. 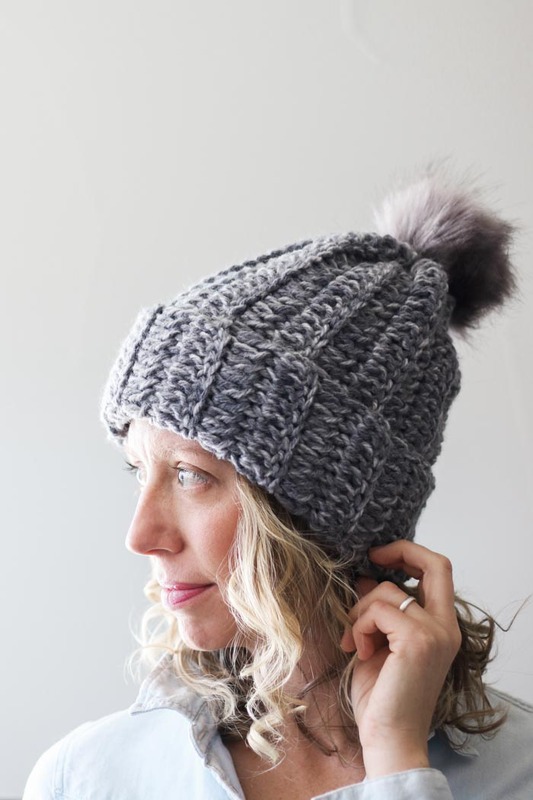 You may want to make a slightly fewer stitches if you don’t want a super slouchy hat. Hi! Thank you for the beautiful pattern – I can’t wait to try it! I’m working on some baby beanies, and wondered how big the rectangle should be for a tiny one? The American Heart Association is collecting red knitted and crocheted hats to give to new babies in local hospitals to raise awareness for heart defects. They said they will take any baby size – babies come in all shapes and sizes! – but I thought I’d ask for advice before I jump right in. Thanks so much! What a generous project you’re taking on! I’d google something like “average newborn baby head circumference” or something like that. Then you can just make a rectangle width slightly less than the total circumference of a baby head to allow some room for stretching. I’m not exactly sure about the height of the initial chain though. Perhaps with some googling you could find an average baby “head height” too? Lol, is that even a thing? 🙂 I’m not sure! But I can find out! I just realized I can also take a tape measure next time I go to Target and see if they have any baby beanies or hats I can measure. Thanks for the input! Hi Thank you for this awesome pattern for the 1 hour beanie – it has taken me much longer, as this is my first time making anything like this, but I am persisting !! I have a question on the yarn – I am using a 5 – bulky yarn, but it is 3.5 oz on the label. I noticed your pattern says 4.0oz . I am using 8.0mm hook per the pattern. I have done all 18 rows and the dimensions of the rectangle are : 11 x 12″. My foundation row of 37 chains comes out to only 12″ long. The 18 rows are only 11 ” wide. vs. 14: Do you think mine is coming out smaller because the yarn is 3.5 oz vs. 4 oz? I chose “5” bulky so I thought that would be the same?? I will just add more rows so it will fit around my daughter’s head, but I’m curious if you can figure out what I did wrong…….. and why my width/ length are so much smaller in dimensions that the pattern says? Jess – a correction to a typo on my prior comment – the dimensions of my rectangle are 12″ (the length of my foundation row of 37 ch) and the width is only 11 ” after doing 18 rows of dcblo…….. when it should be 18″ x 14.5″ I said 14 instead of 18″ in the above comment. So, I’m curious why you think my rectangle is so much smaller? Hi Thank you for this awesome pattern for the 1 hour beanie – it has taken me much longer, as this is my first time making anything like this, but I am persisting !! I have a question on the yarn – I am using a 5 – bulky yarn, but it is 3.5 oz on the label. I noticed your pattern says 4.0oz . I am using 8.0mm hook per the pattern. I have done all 18 rows and the dimensions of the rectangle are : 11 x 12″. My foundation row of 37 chains comes out to only 12″ vs. 14.5″ long. The 18 rows are only 11 ” wide. vs. 18: Do you think mine is coming out smaller because the yarn is 3.5 oz vs. 4 oz? I chose “5” bulky so I thought that would be the same?? I plan to just add more rows so it will fit around my daughter’s head, but I’m curious if you have any idea what I did wrong…….. and why my width/ length are so much smaller in dimensions that the pattern says? These are great questions! 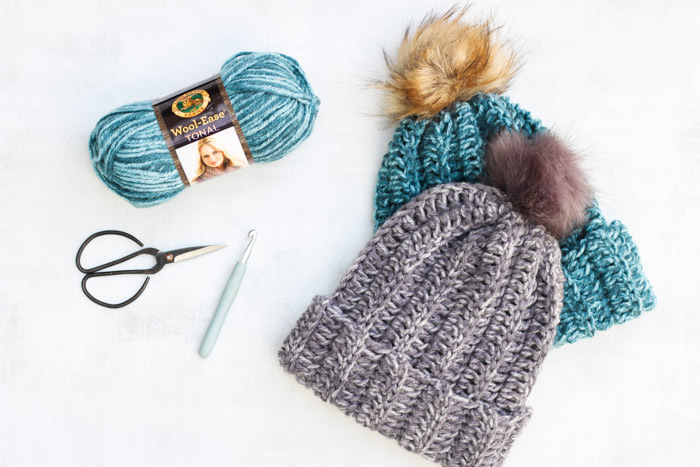 The amount of yarn in the ball (3.5 oz vs 4 oz) should have no impact on how your hat turns out. Instead, it just impacts how much yarn is in the ball. You have the right idea by choosing a category 5 yarn to make sure it’s the same weight as what’s in the pattern. I suspect that your stitches a just a bit tighter than the pattern gauge. You could verify this by measuring a 4″ square of your hat and compare it against the gauge listed in the pattern. How can I make this in. Child size? What are the reduction ratios? It was quick thick and warm, fits just right! I’ll be making more..Awesome! Thank You for sharing! Could I use a k crochet hook? I’m a beginner and It’s the one I have and dont really want to go out and buy one. Hi there, how many skein do I need to use for a M size beanie? Thank you so so much for your instructions. I’m quite green in this craft form. But I am so happy with my results! Your instructions were clear. The beanie was lovely. Thank you for your generosity and patience with all the questions! Loved this- my 1st crochet attempt. Took longer than 1 1/2 hrs 😂 but happy with the results. So glad for video tutorial too! I’d say that is pretty great for a first crochet attempt! Nice job!